Our very amicable hosts, Luc and Nadine, run a dairy sheep farm. 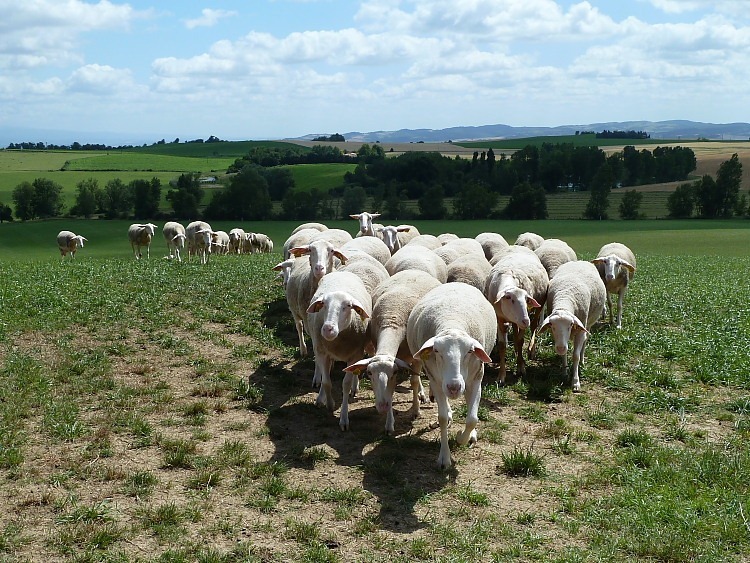 They have a troupeau [flock] of about 300 ewes whose milk is used for the production of Roquefort cheese. The farm land is used to grow food, largely Lucerne, and bedding material in the form of straw from Wheat. For much of year the sheep remain inside their bergerie [sheepfold] consuming the Lucerne and using up the straw. In the summer months when there are a few fields with fresh grass to be eaten, Luc kicks his troupeau out of the bergerie into the fresh air. I say “kicks” because the sheep don’t seem very keen on the idea. They appear to prefer the apparent comfort and, maybe, the safety of their bergerie. This was ably demonstrated when we paused on our way out of the farm to snap a picture of them on the hillside. As Francine approached with her snappy camera, she stood by the gate into and, more importantly out of, the field. You could almost see the sheep thinking, “hooray, someone’s come to take us back to our bergerie” (in French, of course), as they excitedly began flocking towards the gate and Francine.